We will build a 15m2 refuge on this beautiful expanse of wilderness for shelter, comfort and solitude away from the cities and people and close to Nature and Wildlife. The land called “La Jungla” is in the hands of our host brothers Nicolas (24), Lucas (26) and Matias (31) Pimentel and their father, Mario. The refuge will be the only structure in this area. The only other next small building is located a 30-minute walk westwards. 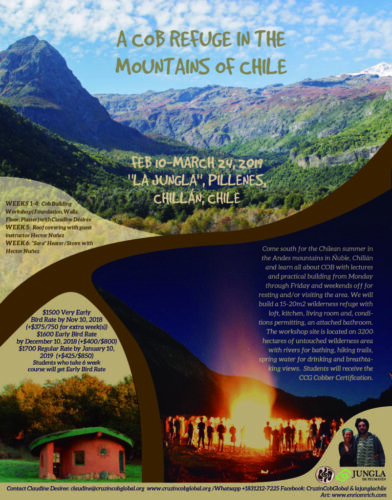 The Pimentel family is very excited to host a Cob workshop on this Sacred Land to keep the footprint light while sharing this pristine space with a well-intentioned and environmentally-conscious community who will add positive energy and a beautiful harmonious earthen structure to the wild landscape. nusual sense of humor and laugh you will definitely enjoy. He will be the Cob Assistant for the workshop while his brothers and father focus on hosting. Nico’s older brother Lucas is also doing architecture school in Santiago and Matias, the oldest, has been living on the land for the past year and is practicing a sustainable and self-sufficient lifestyle. Matias has also participated in Earthship building in Argentina and Uruguay and the three brothers share a love for the land and the objective of building a sustainable space for tourism and workshops, like an Earth School ! I am so excited and happy to share this land we Call La Jungla with a beautiful new Cob Family! And it is so big that there will be plenty of activities! My brother Lucas is a great guide and he knows alot about local and native plants. We will be able to swim everyday, have bonfires, and go hiking and camping to other swimming spots located on the property on weekends! I have even heard that there are some hot springs nearby though I haven’t been yet! You will love the place! The region of Ñuble is located in the beginning of the Southern Zone of Chile, blessed by the beauty of the sea and the Andes Mountains, with big amounts of fresh water and lush forests. The closest main city is Concepción, near the ocean and with many activities going on. Chillán, the larger nearest city is located towards the interior of the region and is quite big and a little chaotic (as many cities in South America are). The land where the workshop will take place we call “La Jungla”. It is located up in the Andes mountains 1 1/2 hours away from Chillán and near a ski town called Las Trancas where alot of eco- and tourist development has been taking place over the past years. The closest town is called Pellines. The big mountain for skiing is called Nevados de Chillán and has 3 volcanoes – one of them that is active today and perhaps ready to go. We have had some smoke pumping out in the last year and some volcanic activity around the area, however the land is located to the north of this area, so there is no risk. The land is owned by my family consisting of 3 brothers (Matias, Lucas and Nico) and our father Mario and Mom Loreto. The land is really huge: 3,200 hectares big! It is like a whole natural park, blessed with native forest, huge old trees, a river crossing all of the valley with fresh water to drink and bathe in, ponds and waterfalls to play in, and many many trails to go explore the land! There is an interesting story that took place on this land. Back in 1820 this place was pure native forest, and the only people walking through it were the Pincheira Brothers: earth pirates who would cross from Argentina to Chile through this land and would steal animals and goods to sell them in other places. There is a huge cave known as the Pincheira’s Cave, where it is said that they would spend the nights during winter time. So based on this, there are many oral traditions around the zone saying that there is a huge treasure hidden somewhere on the land – but if you search for it with ambition, you wont find it!. For the Pimentel brothers, the treasure is the land itself. After the Pincheira Brothers’ time, there was a long period of illegal wood milling. Sadly, some of the forest was taken away, but Nature is strong enough so that it recovered. Today there are two types of native forest: the old one and the new one, each with its own beauty and unique wild life. The area surrounding the land is being used by the forest industry, covering it with many pine and eucalyptus plantations. This is why the brothers feel a big responsibility: they are the protectors of this land which is still wild and natural. In the past few years, we have been working hard to create an eco-tourism project there, with the intention to offer the beauty of this place to the people, but always protecting it and taking care of it. The place is very remote with millions of stars to look at every night. Electricity comes from a water turbine and there is no phone signal yet, so it is very wild and isolated, and blessed with fresh water running everywhere and the Peace of Nature. There are no dangerous animals which makes it very safe to be in. We have built 3 little houses at the entrance of the land: one big kitchen and two little huts. But where the Cob Building workshop will take place is higher and deeper in the land, because we want to start to “colonize” the upper part so the project can have more than one base camp. Summertime is when there is the most activity on the land. Besides the workshop, there will be other work going on, mainly the building of trails, which are being supported by the CONAF (National Corporation of Native Forest). The land is always shared with our friends, so many visitors will be stopping in to help with side projects, to take a look to the cob building, and to share music and good times with the community of cobbers. The weather during summer is mostly sunny and warm, but can get a bit cold at night. Sometimes the rain comes – up in the mountains everything is possible! Winter time is harder because of the snow and cold times. So we are lucky . This is going to be a great month of deep connection with the Earth, Water, Wind and Fire! Check out these two videos of the land by drone…. The 28-day Intermediate Cob Building Workshop consists of 20 days of theoretical instruction (lectures with graphics) and construction for 4 hours in the morning and 3 hours in the afternoon. Students arrive on Sunday and settle in. International students can check with Host about arriving earlier to adjust to time difference, etc. Weekends (Saturday and Sunday) are days off for resting, exploring the area, studying and, if desired, continuing to build at your own pace. The last Saturday morning may include some finishing up work and cleanup. Morning (4 hours) and afternoon (3 hours) sessions each have a 15-minute snack break. Lunch break lasts 2 hours which includes about 1 hour of rest time before the afternoon session begins, with a 30-60 minute lecture, followed by construction. After class there is a 90-minute break before dinner, which may include a yoga or other body relaxation session. There will also be one evening a week after dinner for showing slides, videos and having Course-related discussions. Other evenings are free and/or organized by group for extracurricular activities as desired. The 28-day Course will offer practical learning by building a 15m2/164ft2 (size may be a bit bigger or smaller depending on number of students) curvilinear building. The Course starts with the Foundation work during Week 1. 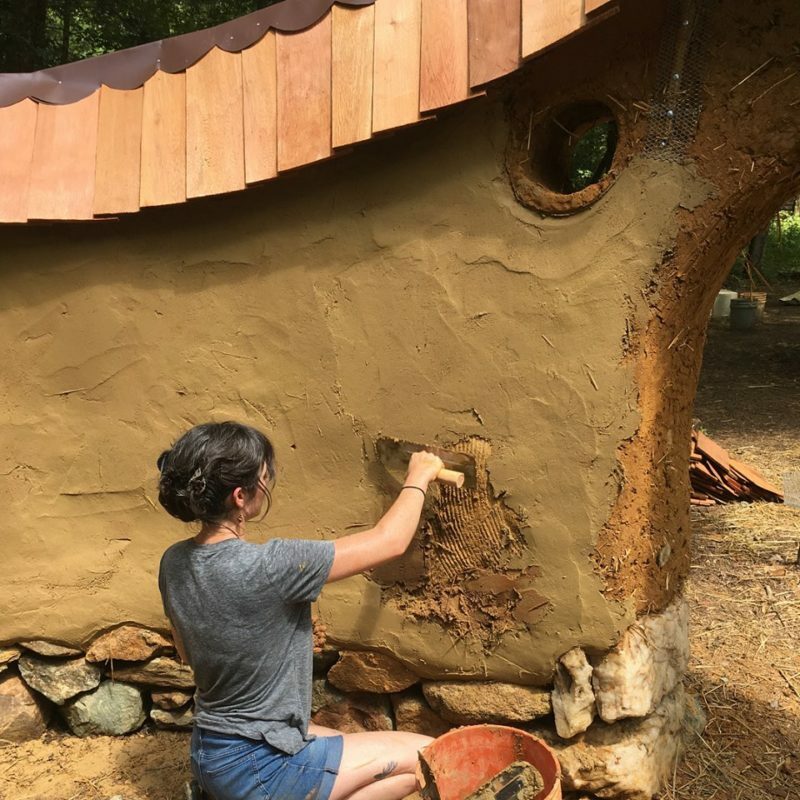 In Weeks 2 & 3 we build the Cob wall, which include a door, opening and fixed windows, shelves, artistic inserts like bottles, driftwood, branches, etc., electrical and plumbing infrastructure, sculpting and the roof connection elements. We will also build the first 10” (gravel, insulation and rough cob) of floor. In Week 4 we will finish sculpting if needed, apply one coat of earthen plaster on the interior and exterior wall, and apply the second coat of floor on the last day. Those who complete the 28-day Workshop will receive the Intermediate Cobber Certification of Completion for Foundation, Cob Walls (which includes Door, Windows, Shelves, Art, Electrical & Plumbing), Floor, Plaster & Roof (lecture only). In Week 5 the workshop will take a new turn and offer a week with Hector Nuñez, . Hector will lead students in the construction of the highly-efficient, low-cost earthen stove & heater developed at the University of Argentina for low-income rural households that goes by the name “Sara”. For more details on the “Estufa Sara” check out this link. Like the rocket stove it uses minimal fuel in the form of branches and small wood pieces and is a double-combustion stove with horizontal and vertical channels built into the upper box, allowing for maximal use of fuel energy for heating the thermal mass of the stove and anything else it passes through, ie a bench, floor, or wall. The “Sara” stove is used for heating as well as cooking on and can also include an oven on the side, which may or may not be part of the workshop depending on number of students and flow of project. You can see Hector’s work on Facebook at Hector Nuñez Docente en Bioconstrucción. The workshop will continue with the same schedule as in the prior 4 weeks, with lecture three times a week, slides and/or video on Wednesday night and hands-on construction the rest of the time. For the first time in a CruzinCobGlobal workshop we will offer an exciting opportunity for students to learn more and get the Advanced Cobber Certificate by completing a week focused only on roof construction. While the wooden structure/framework of the main roof will be built before the workshop in order to help protect the building and students from excessive sun and/or rain, it also permits us to finish the roof in Week 6, when we will build a reciprocal frame roof for the attached bathroom and cover both rooves with a green roof. Hector Nuñez, professional natural builder from Uruguay (see more about Hector in Instructor section below) will teach and lead this week, with the same schedule of lectures three times a week, slides and videos on Wednesday night and hands-on building the rest of the time. Students will learn the structure of roof-building in lecture and we will aim to build the reciprocal roof and put the finishing cover layers on both rooves, knowing that the progress always depends on number and abilities of students, weather and any other unforeseen circumstances. The 28-day Complete Cob Workshop begins on Sunday evening with Dinner and ends on Sunday (4 weeks later) with Lunch. Students may also have the opportunity to stay after the Course and help with the final finish work if needed (additional coats of plaster and floor, oiling and waxing floor, French drain, gutters, inserting door and opening windows into frames, putting in appliances and fixtures) and if offered by Host. Mondays through Fridays we will build and Saturdays/Sundays we will have time off, though students are always welcome to keep building if they so desire. Otherwise there will be time to go to the ocean, hiking, backpacking, rest, etc. The last Saturday will be used to wrap things up and for a final group activity with a celebration dinner. Sunday morning after Breakfast we will hold Graduation and our Closing Circle and the Workshop will end with a delicious farewell Lunch. On other evenings there will be optional additional activities like Salsa Dancing, Fire Circles, Music, Singing, etc. 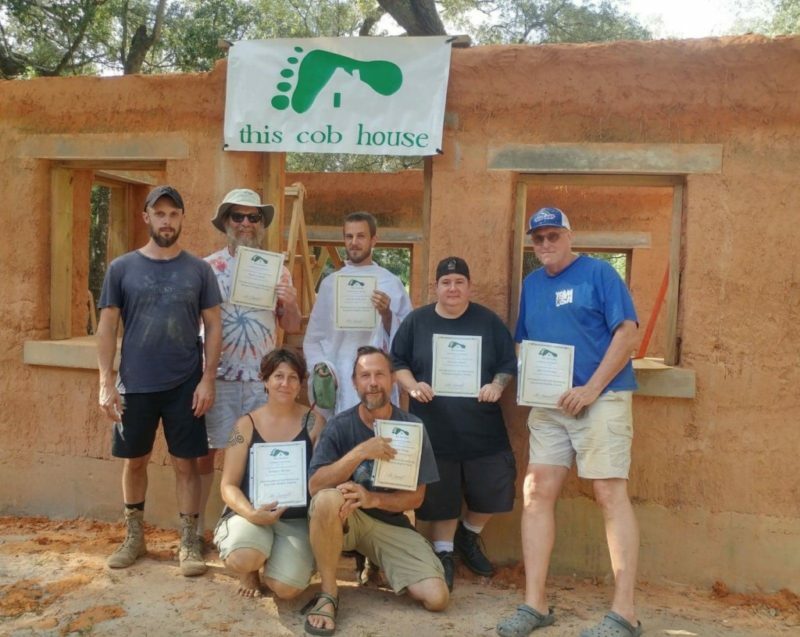 Students will learn every phase of building a cob building from foundation through the roof in lectures/theory. In addition to the lectures, slideshows and videos will be shown to support and enhance their understanding of cob materials, cob building, design, geography , budgeting, business options and legal issues. The same schedule will happen for the Masonry Heater/Stove/Oven week. Students will need to come prepared for physical labor from Day 1. Students are required to read “The Hand-Sculpted House” before the workshop begins and any other book they find, as well as watching videos on YouTube, especially the ones posted on CruzinCobGlobal’s website under Gallery to get an idea of what is expected. Please bring your book(s). Students must tend to their own personal needs, drink alot of water, rest when needed and exert themselves at a steady pace. Students who cannot do the strenuous physical work should let us know before the workshop begins so we can adjust appropriately. It is totally OK to come for the lecture/theory part, and then help the building part in less physically demanding ways, ie cutting straw, sifting for plaster, hammering nails into frames or shelves, sculpting, plastering, cutting bottles. There is alot to do besides making and building with cob!!!! Finally, please bring a watch or use your phone to be prompt and ready for each part of the Course including meals. Feel free to share your dietary needs with CCG or the Host and bring your essential snacks and foods, pillow and whatever you NEED to be comfortable and happy. Feel free to also bring slides, videos, movies and books to share, as well as a sample of your soil to test. This workshop will be in the wilderness so the accommodations will be camping in your own tents. Students who have a real difficulty bringing a tent may ask Host for an alternative shelter or buy a tent in Chile. Days are warm and even hot and nights can be chilly in the mountains. Please bring warm clothes for nighttime and make sure you have a warm sleeping bag. Blankets can be made available if needed. Bring bathing suit, towels, work clothes, weekend clothes, etc. Three meals/day will be served Monday through Friday. Weekends food will be provided for students to prepare on their own. Meals will be vegetarian and delicious as always. If you need meat or other additional nutritional support please bring it or speak with Host about how to get it onsite. Also bring your extra sweets and snacks that you like because we will be far from the nearest store (40 minute drive). The largest nearest city to fly into is Santiago. COPA, LATAM, LanChile, Azul, Avianca and all major airlines fly into Santiago. Concepción also has an airport and is the closest to the workshop site. From Europe, the most economical cities to fly from are London, Rome, Paris and Madrid. I just booked my ticket from Madrid to Buenos Aires with NorwegianAir for 302€, and found another ticket from Buenos Aires to Santiago for 61€ on JetSmart and Sky. While everyone has their favorite search site I like Rome2Rio…When you arrive in Santiago, you can take any bus to Chillán from the Bus Terminal. There are many bus companies and they all stop at Chillán as there is one main highway in Chile. Pullman and Turbus have online reservations otherwise you can just buy your ticket the same day at the station. There is also a train that leaves once a day but it is more expensive. The bus is easiest. However, there is one specific bus line called Nilahue which goes from Santiago to Las Trancas. This is the best because it can drop you in Camino a Pellines (between Pinto and Recinto) and we can pick everyone up from there, which is 45 minutes away from the land. If you go by bus to Chillán, then you will have to take another bus and go to Las Trancas and jump off in Camino a Pellines (km 38). If there are many people arriving the same day, maybe we can go to Chillán to pick them up, or if we are around the city, we can also pick people up. From km 38, we can always pick people up. We will soon be posting the bus schedules to make planning easier. Might be fun to check out Saniago for a few days first and to stock up on whatever you will need for camping for a month. The workshop is divided into multiple options. You can take the 4-week cob building workshop alone or add the 5th week or 6th or both or only do the 5th or 6th or both. However the 4-week workshop cannot be divided up and must be taken entirely. Camping is free. The 6-week workshop is a flat $2250. This includes tuition for Monday through Friday workshop days, all meals 7 days a week, and camping facilities. Weekends are free to explore and travel but if you stay at the site and relax or keep working there will be food available. Weekdays we will have cooks but weekends we will cook together. For the final price for your choice of attendance, please contact claudine@cruzincobglobal.org. Payment can be made by Venmo, Paypal, Zelle, free Bank Transfer to US or European Bank account or Transferwise. Please contact Claudine to register and make your payment and learn how to avoid transaction fees. You can contact her at claudine@cruzincobglobal.org or +1831212-7225 by phone, SMS or Whatsapp. Please contact Nico for questions about travel, accommodations and food. His email is nicpandreu@gmail.com and Whatsapp is +56 990897292. There are 4 work trade positions open in all weeks of the workshop for an hour a day in either the kitchen or onsite. Each position gives $50/week of discount or $200 off for the 4-week workshop and $50 off for each of the other week-long workshops. No experience is needed and they will not interfere with your class hours. Please inquire asap as these are the first spots to go. Claudine Désirée, founder and director of CCG, learned how to cob with Michael Smith in 2003 in northern CA and has been building and teaching ever since completing her first project, her legal 200 ft2 studio, in her backyard. 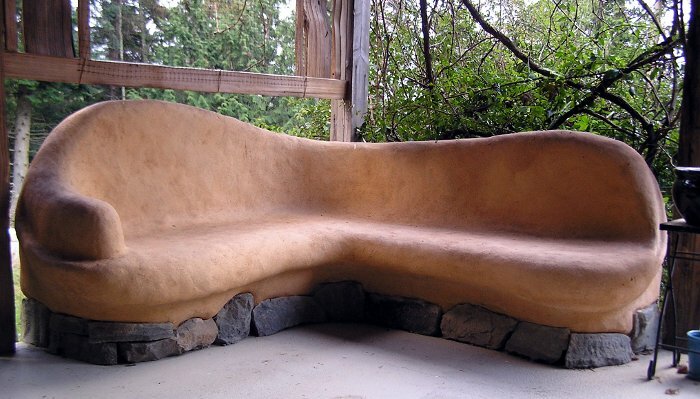 In 2014, she was one of the first people to legalize a cob building on the west coast of the US, where the building code laws are the most stringent due to high earthquake risk. In 2008, she created SunflowerCobBuilding which became CruzinCob and then, in April 2015, evolved into CruzinCobGlobal, the international cob workshop business she runs from wherever she happens to be on the Planet. To date she has taught close to 100 workshops, 25 of which have been part of CCG’s exciting international circuit since the Spring of 2015 in the following countries: Spain, the Canaries (Spain), Senegal, Cabo Verde, France, Morocco, Portugal, the Azores (Portugal), Colombia, Brazil and the US. Hector Núnez is an Uruguayan natural builder and instructor from Montevideo. He has been teaching at the University of the Republic of Uruguay for several years as well as in international workshops. Hector also works privately as a designer and consultant and has been a presenter in international natural building conferences and gatherings. He specializes in earthen construction of all kinds and most recently, has been teaching the construction of earthen highly-efficient “Sara” stoves/heaters from Argentina. You can see more of his work on his Facebook Page Héctor Nuñez Docente en Bioconstrucción. Our vision is two-fold. First, we seek to expand the global awareness, understanding and practical experience of Earthen “Cob” Construction as a safe, healthy, ecological, economical, strong and durable building technique everywhere on the Planet. Secondly CCG seeks to contribute to the reduction in concrete-based construction and cement production thereby increasing the well-being of all Life and our Planet Home. Our mission is to collaborate with individuals and communities around the Planet in organizing and holding Cob Building workshops in which we lead an international/intercultural group of 10-15 students in the construction of all (foundation, walls and floor) or part (just walls) of a small structure (10-15m2 or 110-165ft2) in a period of 21-28 days. We also teach 3-4 day Cob Oven workshops as a shorter and easier option. While we have been able to install rafters and even a full roof in some workshops, it is never guaranteed and so we are choosing not to include Roof in our Workshop description anymore, though it is always a possibility hinging on number and ability of students, size of building, weather and how smoothly the build flows.